So, where’s the Book Roadie these days? So, it’s been quiet around here! That’s because I’m moving in April — and not just moving like I normally do (ie, about 20 minutes away, and via several car trips over a week or three plus one big push with friends). No, no, I’m moving out of state. All at once. This requires, unsurprisingly, a shitton of work. I’ve been sorting through the boxes of miscellanea that have accumulated over my years of not-really-having-to-purge-when-I-move, and I’ll be doing a similar sort through basically all my possessions… except, as will likely surprise nobody, my book collection. I joked recently that once I’ve read a book, it gets a forever home in my library — and I meant it. Anyway. Once I start packing, I plan on doing another series on moving so y’all can come along. I have huge plans for posts I want to write, but right now all my spare time is taken up with my day job, moving preparations, and trying to fight off some bug that’s taken up residence in my body. So hang in there. More posts are coming! It just might be a while. Geez, where did the month go? It’s nearly the end of December, and I never did a quick summary post for NaBoBiMo! 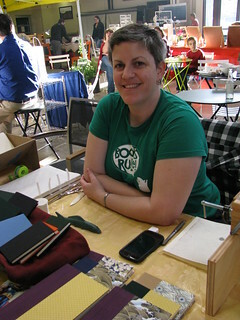 Well, part of that is that I wound up working my first two craft fairs (which went great!). And part of it is that I fell short of my goal, and who likes looking back over not making a goal? Not me! 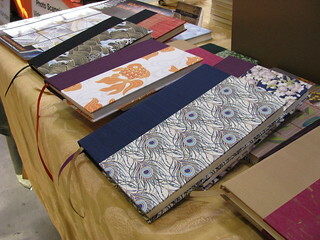 I count NaBoBiMo 2012 as a success, if only because I made way more books than I have in any previous month. Go me! So, this weekend was my first ever time vending at a craft fair! Check out my lil’ table there. The venue was the Lusardi Building at San Pedro Square Market, and the Native Revival Nursery folks organized and ran things. Things were a little chaotic as we were getting set up, but once the fair got rolling, it was great. Lots of people came through in spite of the rain, including a bunch of my friends! Yay! Thanks again for coming, y’all! 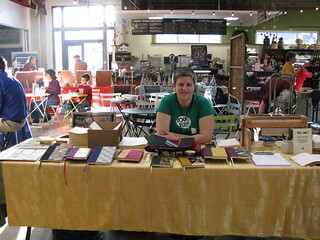 I got a ton of compliments on my books, and sold almost a dozen! This was way better than I expected to do, and enabled me to not only cover the cost of the table and materials/labor for the books I sold, but also the cost of the materials I got to prepare for the fair as well! And have a little left over! WAHOO! 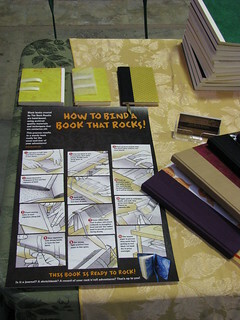 This was also the debut of the amazing poster I got from Calyx Design about how I make my books! Very exciting! Richard even did a post about it explaining the process a little. Very cool! He was amazing to work with, and I cannot recommend him highly enough. Seriously, if you need a designer, work with this dude. He is AH MAY ZING. Above it are three demo books showing different stages in the process, so I could give a more detailed, hands-on explanation for the curious. Then there was my mailing list sign up (you can sign up too, just use the little form in the right-hand column of the blog!). 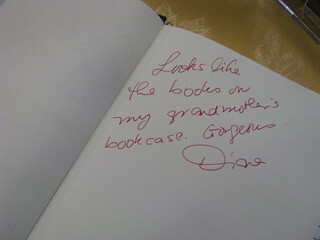 I also, thanks to a suggestion from a friend, set up a book people could write in if they felt like it. 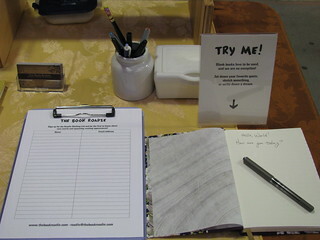 This turned out to be genius — people loved the feel of the paper, had fun thinking of things to write, and in one case it literally made a sale — a very nice lady who only uses fountain pens was skeptical that the paper was thick enough for the ink to not go through it, so I invited her to try writing in the test book. When the ink did not, in fact, go all the way through the paper, her whole face lit up and she spent quite some time choosing a book. She also signed up for my mailing list and took a card. I think I’ll be hearing from her again! It was a great experience overall. I also brought lots of materials (you can see my punching cradle and laying press on either side of me, as well as some in-progress text blocks), and got a fair bit of work done. Win all around. I had a lot more fun than I expected — the day flew by (helped in part by a couple friends who came and helped me so I could do things like eat and run to the bathroom!). I’m still tired two days later, though — I had a very busy Saturday and wasn’t rested going into the fair, and then the fair itself took a lot out of me. I have to remember to do more self-care before and after next time I vend! Speaking of which, it’s looking like I might be doing a mid-week craft fair next week at a local school — sign up for my mailing list and you’ll be the first to get the full info. So, y’all may have noticed that I haven’t been updating about NaBoBiMo much. There’s two reasons for that. The first is that it’s become pretty clear that I can’t maintain my day job and my health AND hit the 30-book-mark by Friday. Realizing that was kind of demoralizing. The second reason, though, is super exciting! 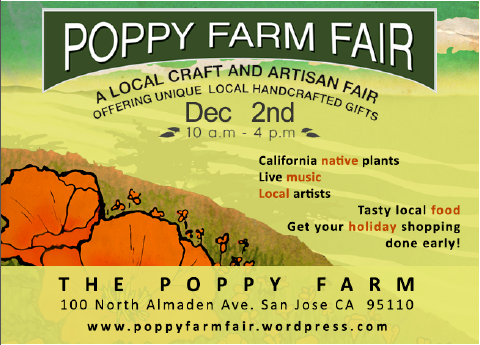 I’m going to be vending this weekend at the Poppy Farm Fair! Preparations for that have kind of eaten up the time I would be using for NaBoBiMo. If you’re in or around San Jose this weekend, come on by and say hi! This will give you a chance to actually handle the books, and to see my spiffy new informational posters. I’m really excited about this. I’ll have all my NaBoBiMo books (well, the ones that are ready to go, anyway) with me, plus the ones currently listed in my Etsy shop. 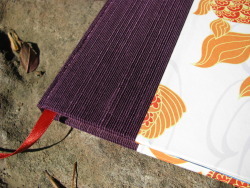 I’m also going to have a swatch book and custom book order forms, so if you want a color/pattern combo I don’t currently have available, you can order it from me! Pretty exciting. Yeesh, the month is getting away from me! Good thing the holiday weekend is coming up. Hopefully I can crank out enough text blocks in time to get them trimmed by the lovely folks at Signature Print Services before Turkeyday. Up top are six text blocks almost ready to trim. 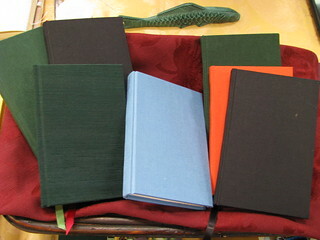 Below are two text blocks ready to prep for binding and four finished books. The colors aren’t quite true here, since it’s night time, but the right one has gold fabric and a sort of orchid violet with gold brushstrokes on it. So pretty! If I bind two books a day for the rest of the month, I’ll be four short. Since I should be able to bind at least three or four a day over the holiday weekend, that’s actually not too bad! The real bottleneck will be getting the text blocks trimmed. Cutting/prepping of materials: Cover materials almost entirely prepped! About 1/2 of endpapers prepped. Posted in Hangin' out Backstage	| Tagged bookbinding, NaBoBiMo	| Comments Off on NaBoBiMo Day 19! Pretty sweet, eh? AND I prepped two more text blocks for casing in. Woot! The other thing I did today is finish hacking up all the paper and bookcloth I have — which turns out to only be enough for a total of 25 books. Oops. So my estimates were a leetle off. Welp, two books are IN THE PRESS and drying, so as of tomorrow, I will have two books FINISHED. I’m looking forward to casing in more and more books as the month progresses. 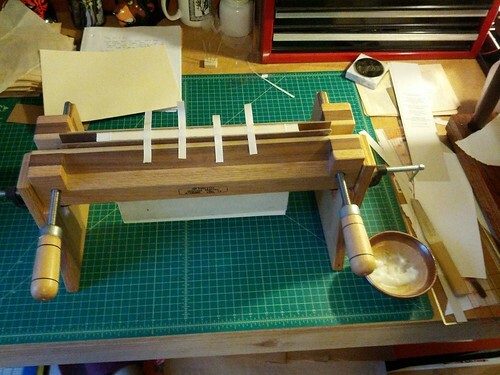 Because I only have one nipping press, I can only do 2-3/day, so I’m glad to have some in already. Wooo! The other book-related thing I did today was post a bunch of books over at my Etsy store. Just in time for y’all to start your holiday shopping early! Check it out! Posted in Hangin' out Backstage	| Tagged NaBoBiMo	| Comments Off on NaBoBiMo Day 11! What you see there are two text-blocks nearly ready for casing-in! 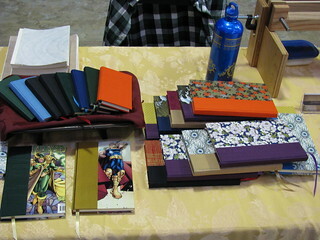 Casing-in is the process of putting the cover on a book. Once the cover’s on, it dries overnight in the bookpress and then is basically complete unless I want to do something fancy like KwikPrint a title on the cover or something. I also sewed up two more text blocks. Posted in Hangin' out Backstage	| Tagged NaBoBiMo	| Comments Off on NaBoBiMo Day 9! NaBoBiMo Day 7! Back at it! After two days off, my paper arrived and I was able to find a local print shop to cut it for me! I got a little more work done this evening, too. Yay! Back on the wagon at full tilt tomorrow. Gotta make up for lost time. Posted in Uncategorized	| Comments Off on NaBoBiMo Day 7! Back at it!